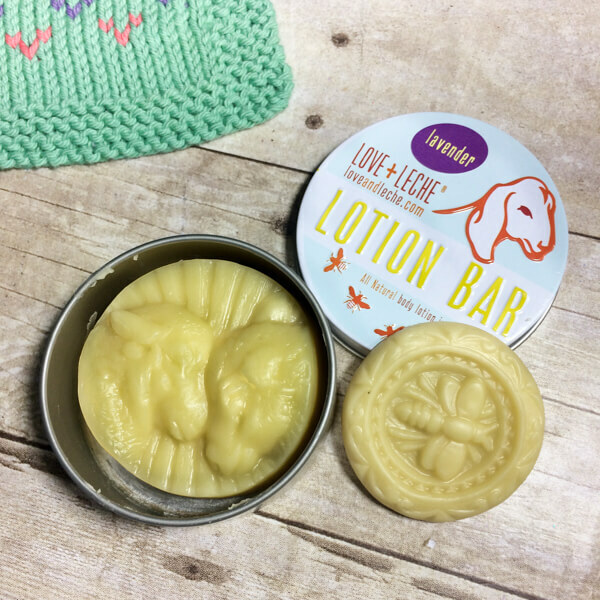 When I was offered the chance to review a Love+Leche Lotion Bar I jumped at the opportunity! I had seen them on social media and was smitten with the adorable sheep design and drawn to the all-natural ingredients. When I received it, I immediately popped it in my project bag and started using it. So what do I think? First, I looooove the scent! I received a lavender scented lotion bar and a mini bar in the citrus-rose scent. Both smell amazing! They also did a great job keeping my hands moisturized without feeling greasy or sticky which of course makes working with yarn much more pleasant. Last, but most important to me, is that these are handmade with all-natural ingredients such as pure beeswax, coconut oil, almond oil infused with Certified Organic calendula flowers, and essential oils. I would definitely recommend these lotion bars to keep in your purse or your project bag. They would make a great gift too! You can check out the full line of products and all the available scents on the Love+Leche website here. And as a special treat, Love+Leche is offering a free mini balm sample ($4 value) when you buy one lotion bar in a tin (min $14) and use coupon code petals at checkout. Offer expires May 1, 2017. Enjoy!